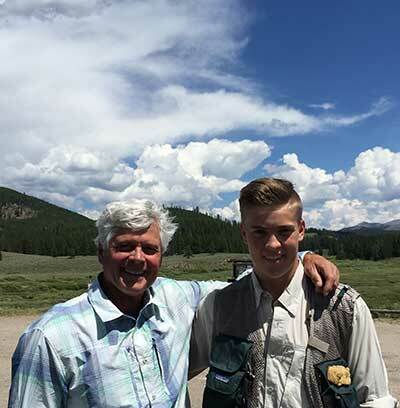 Craig Mathews is one of the most avid fly fishers in the world right up there next to Yvon Chouinard. That’s saying something because I’ve met a lot of adults who are crazy about the sport. Craig believes that tenkara fishing is the simplest, most effective and efficient form of fly fishing. I agree. Anyone ranging from three years old to ninety can learn how to fly fish with tenkara in just a few casts. Some of my friends don’t fly fish because they think it’s too intimidating and they don’t want to look dumb. You can’t look stupid with tenkara. Through years of experience Craig has been able to pinpoint the strengths and advantages of tenkara. Fishing tenkara on water types from spring creeks like O’Dell to big rough and tumble rivers like the Madison, to small freestone creeks and mountain streams, is much more efficient and effective. Craig says it boils down to the mechanics of getting an artificial fly onto the water. There’s no reel so there is never line hanging off to get tangled in the weeds and brush along the creek. With a shorter fixed length, an angler is forced to get closer to rising trout to make a pinpoint accurate presentation. By getting close to rising fish, drag—the biggest enemy of dry fly anglers—can be defeated and anglers will keep track of their fly easier. Nymphing anglers in the fall will find tenkara fishing especially effective. The line can be be kept off the water with the length of the rod that allows you to keep in touch with the fly and it defeats drag. It truly is a different yet simpler way to fly fish in not only Craig’s eyes, but also mine. I’m learning that fishing isn’t about the dazzle and prestige of the gear; tenkara proves it. 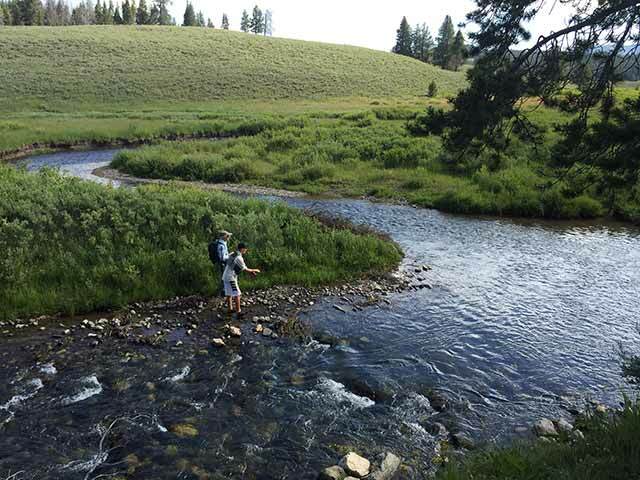 The first time I grasped a tenkara rod was with Craig on Fan Creek in Yellowstone National Park. The rod was something different. It was light yet incredibly long, which made it incredibly easy to cast without all of the excess line. He told me it’s like a cane pole; something I knew nothing about. Fan Creek is a small mountain-fed tributary where trout come from the main Gallatin River to cool off during hot summer days when water temperature rises and flows drop. After just a few short hours of fishing with the tenkara rod, I was instantly hooked, and had to get one of my own. Being able to get up close and personal, seeing my fly just a few feet in front of me, and being able to catch a trout with a tenkara rod was exhilarating. My first tenkara rod was an 8’ 6” Patagonia branded version, a gift to me from Craig, with me making the promise it would get used. As soon as it came in the mail, I wrote a thank you letter to Craig, then called up my good friend Jeff Lazlo, owner of the ranch where O’Dell Creek flows, and asked if I could swing by and try out my new rod down on the water he restored. As soon as I heard “Yes, of course,” I hung up and rushed down to the Madison Valley, and started fishing with my tenkara rod on O’Dell. It was grasshopper season. I tied on a smallish orange and grey hopper pattern, and began my hunt. Honest to God, in my first cast, I caught a 20” brown trout right underneath the bank, and eight more good size trout. Casting was made much easier with less line; I was able to place my flies more life-like on the water, making them more realistic to the fish. In just a couple of hours of fishing with my tenkara rod, it became my most successful day on O’Dell Creek. I would strongly encourage fly fishers of all skill levels to try tenkara. It is such a simple way of fishing. Tenkara, as I said, is perfect for a beginner to learn the basics of the art of casting before switching to a normal fly rod and reel. Fly fishing might look hard and complicated, but tenkara really brings out the simplicity of fly fishing, and can easily make an ordinary spin-cast fisherman into a fly fisherman. With Tenkara instead of being able to cast from afar you have to really move discreetly toward the fish, because your line isn’t more than 12-plus feet. Rather than sitting back and casting to the fish you have to stalk it, hunt it, and then catch it. I think it forces you to learn more about the water. Small creeks or streams are the best waters for fly fishing with a tenkara rod, because it is much easier to cast and position yourself when in the shadow of trees or bushes, rather than on a larger river where it is much harder to reach the fish, especially in windy conditions. But you can still fish bigger rivers with a tenkara rod. If you are interested in buying a tenkara rod, most fly shops carry them, or you can just order one online and begin your hunt. Craig and Yvon are not only champions of tenkara, they wrote a book about it, too, titled Simple Fly Fishing: Techniques for Tenkara Rod and Reel, that is worth checking out.